Enset (Ensete ventricosum (Welw.) Cheesman) is a tall herbaceous plant from tropical Eastern Africa related to the banana. 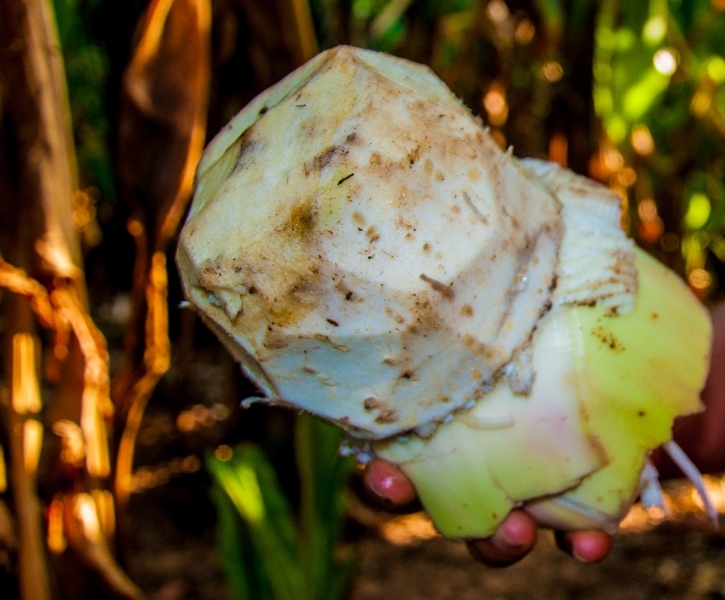 Enset is grown in Ethiopia for its starch-rich basal pseudostems (trunks) and their swollen underground parts, called corms, which are an important staple food for the inhabitants of the southern and south-western areas of the country. In Ethiopia, enset corms and pseudostems play a major role in food security, and they are also occasionally fed to livestock (Desta et al., 2004). The sustainability of enset farming systems is currently endangered by the bacterial wilt disease, so the future of the crop is in question. However, enset grows in many tropical countries and its corms and pseudostems are an underexploited high-energy feed resource. 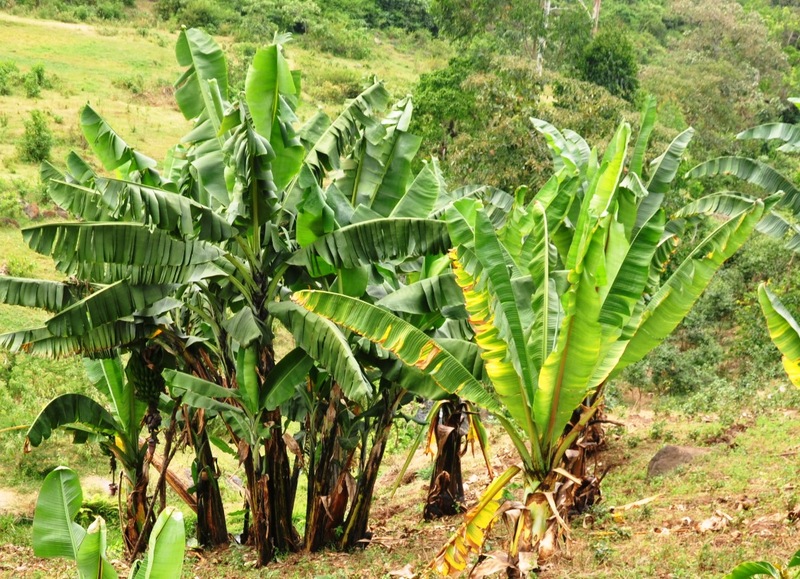 Enset, also called false banana, is a close relative of the banana tree (Musa sp.) and morphologically similar. Both are large herbaceous and monocarpic plants that flower only once and then die. 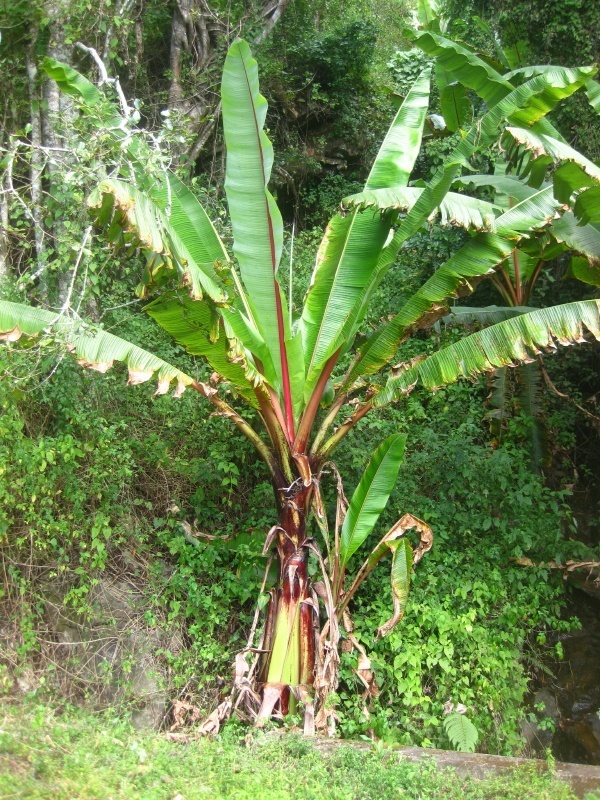 The enset plant is taller and thicker than the banana plant, and its fruits are not edible (Tsegaye et al., 1992). Enset is a perennial plant that reaches a height of 4-11 m. Its root system is adventitious. The trunk (pseudostem) is made of overlapping leaf sheaths. The underground and basal swollen parts of these leaf sheaths form the corms. The corms are 0.7-1.8 m long and 1.5-2.5 m in diameter at maturity (Tsegaye et al., 1992). Corms represent about 25% of the total DM of the plant (Fekadu et al., 1997). The leaves are spirally arranged, emerging from the apex of the corms. Leaf blades are entire, 5 m long x 1.5 m broad, with a strongly channelled midrib and numerous lateral veins. The leaves are bright to dark green in colour (Tsegaye et al., 1992). The inflorescence grows at the apex and droops out of the centre of the pseudostem. Flowers are unisexual, very similar to those of the banana (Musa sativa): female flowers develop proximally, male flowers developing at the distal end of the inflorescence. The fruits are oblong-obovate berries, 8-15 cm x 3-4.5 cm, orange when mature, rather dry and fibrous. The berries contain 1 to 10 large (1.5-2.5 cm in diameter) black seeds (Tsegaye et al., 1992). Enset corms and pseudostems are a staple food in Ethiopia. Enset is also grown in North and Central Vietnam, where the growing point is used as a vegetable (Tsegaye et al., 1992). The corms and lower parts of pseudostems are scraped to extract a fibrous and starchy pulp used to prepare popular nourishing specialities (kocho, bulla, amicho) (Brandt et al., 1997; Kassa et al., 1993; Tsegaye et al., 1992). The pulp is fermented in a pit from 2 weeks to 18 months. The fermented pulp is mixed with water and sieved to make a dough, which is rolled and baked between enset leaves in an oven or on an open fire. Enset is of outmost importance for Ethiopian smallholders: in 2006, about 20 million people were relying on enset production for their staple food (Joshi, 2006). However, a bacterial wilt (Xanthomonas campestris), was first reported in 1960, and has become increasingly rampant since 2000. The disease hampers enset production and the enset population is decreasing (Deribe Gemiyo Talore, 2015). By 2015, it was reported that 80% of enset farms were contaminated (Africa Rising, 2016). The declining production of enset is a threat to food security in Ethiopia. Enset is a multipurpose plant. After the pulp has been extracted, the leaf sheaths can provide good quality fibre to make rope, baskets, mats and sacks. Enset landraces with peculiar leaf and pseudostem colours are grown worldwide for ornamental purposes. Enset is reported to have many ethnomedicinal uses (Tsegaye et al., 1992). In addition to food, enset provides valuable feed for livestock: all parts but the roots can be fed to farm animals. Enset leaves, in particular, are widely used in enset-producing regions and are available during the dry season (Fekadu et al., 1997). In the Bale highlands of South-Eastern Ethiopia in the late 1990s-early 2000s, several enset-based systems were coexisting: livestock-enset, enset-livestock and enset-livestock-cereals. In these systems, livestock provided manure to the enset crop while enset provided crop residues to livestock. 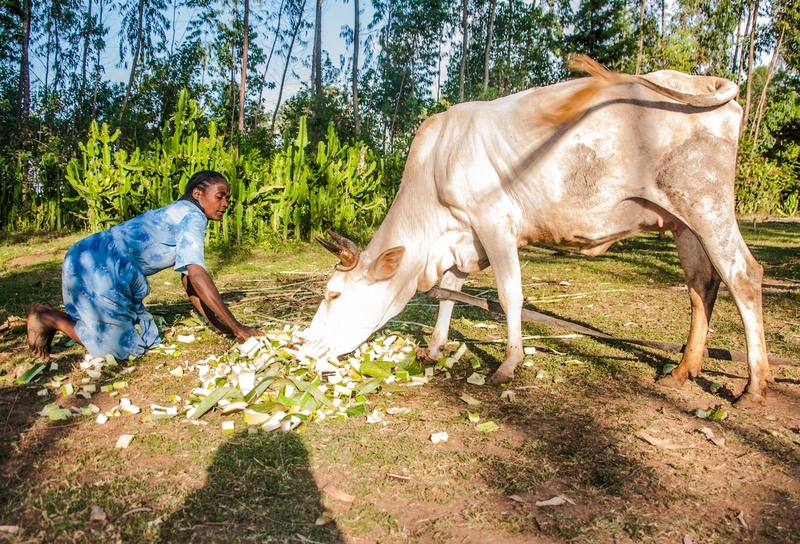 About 85% of the farmers fed enset leaves, corms, pseudostems, fluid (moccaa) and processed by-products (raw kocho) to livestock during the dry season. The enset leaves, corms and sheaths were pruned and chopped. However, supplementation with enset products did not significantly reduce cattle mortality. In livestock-enset system and livestock-enset -cereal systems, enset crop residues are consumed soon after harvest and not saved (or only in small amounts) for dry season feeding. On the contrary, grasses from pastures are preserved in range enclosures and do have a significant effect on livestock survival. Enset leaves and by-products could better contribute to alleviate dry-season feed shortages but more farmer awareness regarding preparation methods is needed, as well as better technology to improve the value of enset leaves and by-products as feed supplements (Desta et al., 2004). Enset is native to Ethiopia, where it was first domesticated 6000 years BCE. Ethiopia is the only country where enset cultivation is economically important. It is mainly located in the Southern Highlands, and it also grows in the Central and Northern Highlands around Lake Tana, the Semien Mountains, and as far north as Adigrat and in Southern Eritrea (Brandt et al., 1997). Outside Ethiopia, enset is reported to have provided an emergency food source in Vietnam during the Second World War (Tsegaye et al., 1992). Enset is indigenous throughout tropical Africa, southward from Ethiopia to South Africa and westward from Ethiopia to the Democratic Republic of the Congo. It occurs in montane and riverine forests, often in clearings, gullies and near streams. In Ethiopia, it can be found within an altitude of (500 m-) 1000-1600 m (-2400 m) (Tsegaye et al., 1992). In cultivation, enset grows best between 1800 m and 2450 m but scattered plants can be found at lower altitudes, and growth remains possible at up to 3100 m. At higher elevations, low temperature and frost hamper growth, and maturation may take twice as long, or more, than in lower levels. Temperatures between 16-20°C are optimal, but growth is acceptable from 5 to 25°C. Optimal growth occurs when average annual rainfall is between 1100-1500 mm. Established enset plants are tolerant of drought and frost. Enset grows well in most fertile and well-drained soils. Best growth is obtained in moderately acidic to alkaline soils (pH 5.6-7.3) with 2-3% organic matter (Tsegaye et al., 1992). In Ethiopia, food security is better in enset-based farming systems than in those that are cereal-based (Ecocrop, 2016). In 1992, Ethiopian statistics indicated that there were 167,900 ha of enset (Tsegaye et al., 1992). However, with enset being increasingly affected by bacterial wilt (Xanthomonas campestris), production is declining (Deribe Gemiyo Talore, 2015). Enset can be propagated by seeds or by suckers. It can be grown in monocrop or intercrop systems in association with cereals or legumes. Enset requires good weeding during the first stages of growth and it responds positively to manuring from animal or household sewage. Some pruning should be done every year until the plant reaches sufficient maturity to be harvested (about 3-4 years or 9-14 years after planting, but it can be harvested at any time after 2 years) (Kassa et al., 1993; Tsegaye et al., 1992). Harvest should occur during the period surrounding the appearance of the inflorescence. If corms are harvested to make amicho (fresh corms cooked like potatoes), they should be harvested at an early stage. If the corms are intended for kocho, they need to have a high starch content which is more likely to happen soon after the inflorescence appears. If harvest is delayed until flowering the leaves die and the inflorescence starts to use up the starch. Harvesting involves cutting the leaf sheaths from their base at the junction point with the corm. The corm can then be extracted from the ground. Enset harvest is a time-consuming activity (Tsegaye et al., 1992). Enset is a soil building crop. As a perennial crop, it does not require tilling and its extensive plant canopy intercepts rainfall: erosion is thus limited. The deep roots increase water infiltration and decrease surface runoff, resulting in more water in the soil and aquifers. Water volume, availability and duration of discharge to springs are enhanced, which can decrease the effective length of the dry season (Brandt et al., 1997). In addition, enset culture builds soil organic matter and soil fertility. After corm and pseudostem harvest, enset leaves can be used for mulching, which enhances organic matter and soil protection. It has been reported that enset enhances soil fertility to a level greater than those of adjacent fields or pastures (Shank et al., 1996). In the Sidama Midlands, where the cultivation of coffee as a cash crop dramatically reduces grasslands, enset provides valuable crop residues that can be used to feed ruminants, and also provides shade to the coffee plants (Yilma Tsegaye, 2001). Enset corms and pseudostems have a high moisture content: they contain more than 75% and 90% water, respectively. While this may limit intake, it can be a desirable trait in dry periods when water is lacking (ILRI, 2015). Enset corms have a low protein content (less than 4% of DM) and a high starch content (more than 70% of DM). Their NDF content is medium but highly variable (46% of DM, range 13-89%) but the ADF content is low (less than 2% DM). Enset pseudostems contain slightly more fibre (NDF 56% of DM) and less starch (about 60% of DM). Variability in composition is partly explained by varietal differences (Nurfeta et al., 2008a). There is no particular caution or negative consequence of feeding enset corms to ruminants. Enset corms are rich in starch and are, therefore, a good source of energy useful for ruminant diets based on low quality forage, provided that the diet is supplemented with protein. Because enset corms and pseudostems are essentially used for food in Ethiopia, where they play an important role in food security, there have been few studies on their role in feeding livestock, though they are actually used together with enset leaves, fluid and processing by-products to feed livestock (Desta et al., 2004). Because enset corms have a high starch content and relatively low ADF content, the OM degradability measured in vitro is very high (94.5%, Mohammed et al., 2013). When measured in sacco, the DM degradability of different varieties was also high at about 80-85% after 24h (around 45-55% after only 4h) (Fekadu et al., 1997; Nurfeta et al., 2008a). This suggests that most of the fibre faction is rapidly digestible in the rumen. The DM and OM in vivo digestibilities were high (78%) (Nurfeta et al., 2009). Offered as sole diet for a short period, corm DM intake was low (24.2 g/kg W0.75), possibly due to the very low protein content (Nurfeta et al., 2009). When offered as an energy supplement (250 g/d) with a small quantity of legume (Desmodium intortum) hay (100 g DM/d) to sheep fed with straw during the dry period, enset corms could maintain body weight or a small daily gain (Nurfeta et al., 2008b). When corm was offered at about 165 g DM/d to sheep fed with wheat straw and 100g DM/d of legume hay, the diet DM digestibility was 59%, but N retention remained negative. A level of 200 g DM/d legume hay was required for a positive N balance (Nurfeta, 2010). When corms were used as an energy supplement with a low-quality Rhodes grass hay (3% CP) fed ad libitum and a small amount of niger cake (100 g DM/d), the hay DM intake decreased with increasing amounts of corms offered (from 129 to 248 g/d) but the DM digestibility of the diet and daily weight gain (81-89.7 g/d) were unchanged, regardless of the amount of corm offered (Nurfeta et al., 2014). No information could be found about the feed value of enset corms and pseudostems for pigs. However, it was reported that feral pigs were detrimental to the plants, which may indicate that pigs can feed enset corms and pseudostems. It has been reported to be more suitable for fattening pigs in an extension technical document (ILRI, 2015). Enset corms are sometimes available to scavenging poultry as kitchen leftovers (Hayat et al., 2016; Kibreab et al., 2015). No information is available in the international literature (October 2016) on the utilisation of enset corms or pseudostems for feeding rabbits. However, these products are mainly used as human food and have been evaluated positively in ruminants. For this reason corms and pseudostems could probably be safely offered to rabbits. Due to their low protein content and the high level of starchy soluble carbohydrates, they should be used as an energy supplement. Some experiments on their actual use as rabbit feed would be welcome. Joshi, R. M., 2006. Agricultural Biotechnology. Gyan Publishing House, 273 pp. Yilma Tsegaye, 2001. Coffee-Enset-Livestock interaction for sustainable livelihood in the Sidama area of Southern Ethiopia. Western Michigan Univ. Int. Conf. African Dev. Arch., Paper 39.